Discover how to wear rings based on their meaning according to each finger, ring style and other jewelry. Your jewelry says a lot about you, that’s for sure. The type of jewelry and accessories you choose, the gemstones or materials, the designs – every one of these elements is a puzzle piece that completes your personality. But what you may not know is that rings have different meanings depending on the finger you wear them. From your marital status to mafia connections, the rings you are wearing offer interesting meanings. To find out more about rings for women, check out this article. Read further to discover how to wear rings like a fashion pro. There are many rings styles, so here is everything you need to know about different ring types and how to wear them. A three-stone ring has a center stone betwee two smaller stones. It is less subtle than a solitaire ring, but you can still wear it to both formal and informal ocassions. It offers a lot of brilliance so make sure you wear it with a neutral manicure. A halo ring has a center stone in a bezel setting surrounded by one or two channels of smaller stones. The halo ring can be a statement ring, so leave it for formal ocassions or cocktail parties. A cluster ring features many small gemstones clustered together. They don’t need to be in a round shape. When you learn how to wear rings, you should remeber that a cluster ring is perfect for a night out or even a formal gathering. A cocktail ring is a big statement ring which is great for cocktail or club parties, as well as formal ocassions. Wear statement earrings with it, but leave your bracelets at home. A simple band without gemstones is versatile and you can wear it any time. 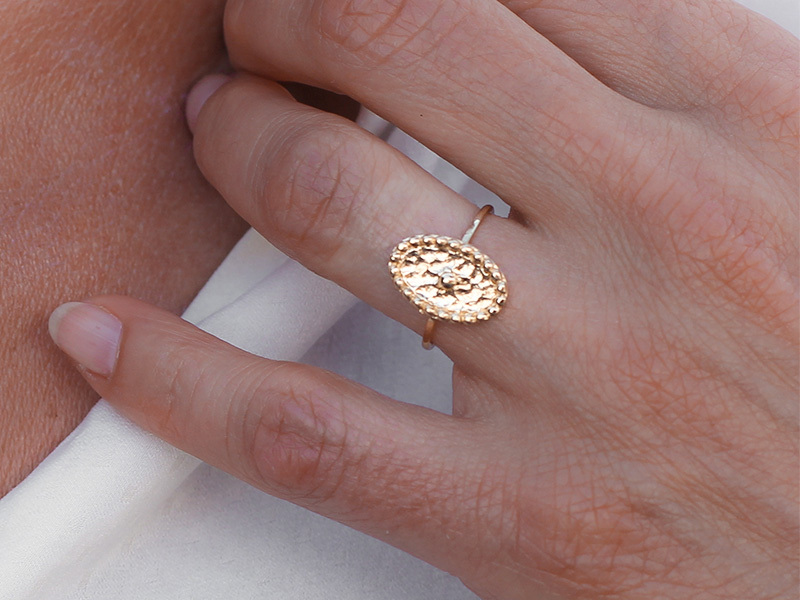 For formal occasions, though, you need a little bit of brilliance so, if statement rings aren’t your thing, choose a delicate ring with a channel setting. The geometric ring is creative and contemporary. Wear it with simple minimal outfitgs to add a cool edge to your look. A stack ring can feature multiple bands stacked together. You can buy it as one piece or create it at home by wearing multiple rings on a finger. To find out how to stack your rings, read this article. Firstly, you should know there is a meaning to the finger to choose to wear your ring on. Read further to find out how to wear rings on each finger. The left hand is associated with love and romance in almost every culture because of its proximity to the heart. This is why wearing rings on the fingers of your left hand has a lot to do with romance and marital status. However, there are exceptions to this rule. The pinky – In the past, wearing two rings on your pinky meant that you were married. The bottom one was the wedding ring, while the top one represented the signet ring. However, this meaning is obsolete right now and wearing rings on your left pinky is associated with mafia connection. Speaking about looking tough, huh? For a great effect wear a cluster or a geometric ring on your pinky. The ring finger – Your left ring finger is usually reserved for your wedding band. If you ever wondered why it’s because of the Romans. They believed that there was a vein that travels directly to the heart from the ring finger. And, speaking about romance, on your ring finger you also wear your engagement or promise ring. Read this article to discover the best celebrity engagement rings. The middle finger – We know what you are thinking, but don’t go there. Wearing your ring on the middle left finger has less to do with nonverbal insults and more to do with power. It means that you have the power to accept responsibility and always ready for a good challenge. A solitaire or three-stone ring looks great on the middle finger. The index finger – If you were wondering how to wear rings on your index finger, then do it with style. The left index finger means leadership and it is also an ideal finger to show off a stunning sapphire ring, for example. 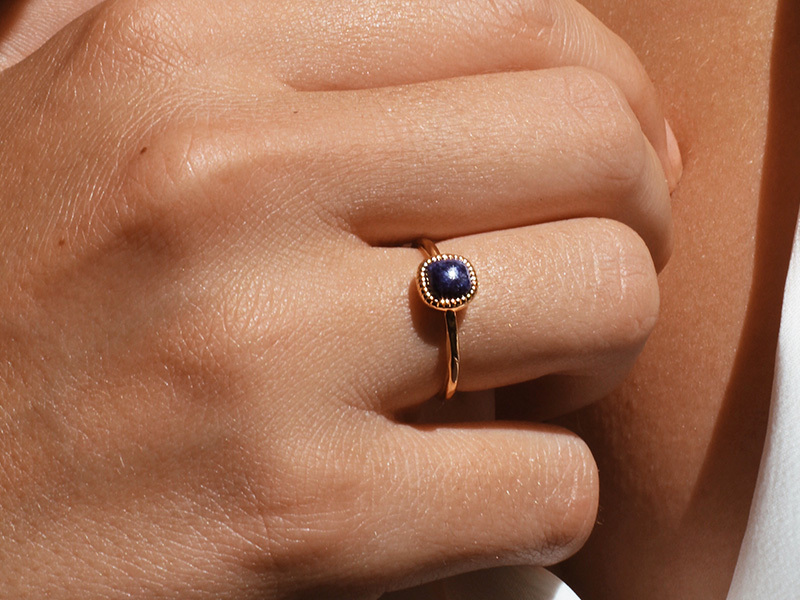 Many women choose to wear a cocktail ring on their index finger or another type of statement ring. The thumb – Wearing a ring on your left thumb finger symbolizes stubbornness and a hot temper. In recent years, however, it has become a fashion statement to adorn the thumb with a beautiful gemstone or cocktail ring. While the left hand has always been associated with romance, the right hand stands for creativity and professional goals. Once again, there are exceptions to this rule as you are about to discover. Read further to find out how to wear rings on the fingers of your right hand. The pinky – No more mafia connections this time. Your right pinky is reserved for your professional status (and we are hoping it has nothing to do with the mafia). In engineering and ecology, as well as in other professions, people wear a ring on their pinky as a symbol of their graduating degree. Some people may wear this professional ring on their left pinky if they are left-handed. The ring finger – If you are living in Germany, Russia or India, wearing a ring on your right ring finger means that you are married or engaged. For the rest of the world, it means creativity and resourcefulness. 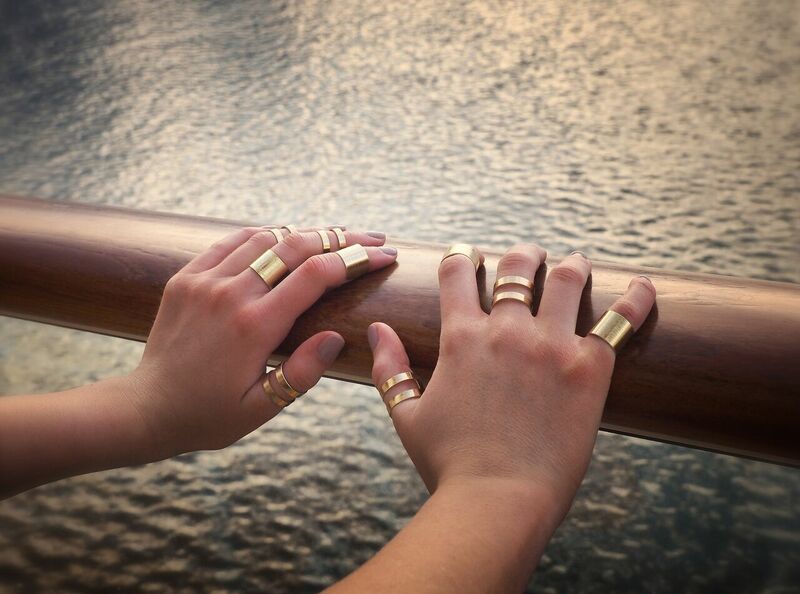 In astrology, the right ring finger is associated with the moon, which means tranquillity and femininity. A bezel moonstone ring would look great on this finger. The middle finger – A ring of your right middle finger can signify balance and strong beliefs. People usually wear rings on their right middle fingers during business meetings to subconsciously assure their partners that they are trustworthy. Wear a stacked ring or a simple band on this finger, depending on your personal style. The index finger – In the traditional Jewish wedding ceremony, the groom places the wedding band on the bride’s right index finger. In other cultures, however, a ring on the right index finger suggests discretion and the ability to rule. A halo ring always looks stylish on this finger. The thumb – A ring on your right thumb can be a fabulous fashion statement, but it can also symbolize your desire to impose your will. In recent years, high-ranking corporate leaders have started to wear rings on their thumbs. It is very important how you style your rings with other jewelry and your outfits. These look great with other gold jewelry. You can create a theme and wear different types of gold. With a rose gold ring, choose an yellow gold necklace and white gold earrings, for example. A gold or gold plated ring goes great with any outfit, but looks the best with simple white shirts and cigarette pants. Silver rings are versatile and work wonderful with stainless steel or titanium jewelry. Some people also combine silver with gold, but be very careful when you do that. There are some rules you need to follow. To find out more about how to style your silver ring, read this article. These rings are elegant and you can only style them with either platinum or white gold jewelry. You can also wear a platinum ring with a pearl necklace, for example, but make sure your outfit is elegant. An assymetric gown looks great with a platinum ring and pearl earrings in a paltinum setting. 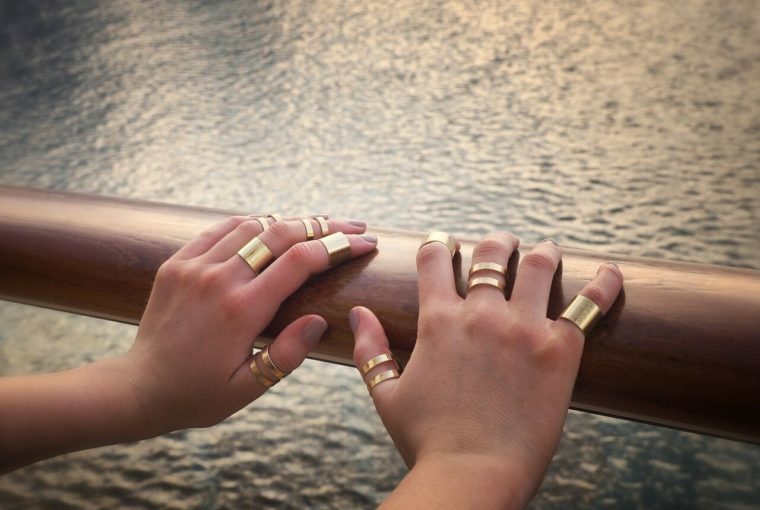 Copper & brass rings look wonderful with yellow gold and rose gold jewelry. They are more casual, so your outfit needs to be appropiate. A flowery summer dress with a couple of thin gold bangles and a brass ring will look gorgeous. Gemstone rings can be versatile depending on the stone. While semi precious stones work with any jewelry type and outfit, leave your precious stones for elegant ocassions. Another rules is that halo, cocktail and statement rings work with a statement necklace or statement earrings, but never with a chunky bracelet. Solitaire rings, simple bands and three-stone rings can work with any type of statement jewelry. As you can see, a ring is a powerful jewelry piece that has a lot of meanings depending on the finger you choose to wear it on. And since now you know how to wear rings, check out Ana Luisa online shop to view our gorgeous designer ring collections. Use our size guide to select the rings according to the fingers you plan on wearing them. For more interesting jewelry information, read our other articles as well.